"...we're here to tell you, after testing four pre-production prototypes, that not only is the Turbo one of the most exciting-looking motorcycles in recent history, it's one of the most thrilling to ride as well." 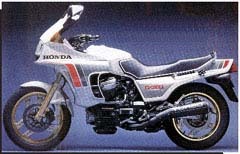 All eyes were on the CX500TC Turbo, the first factory turbocharged motorcycle, back in 1982. The promise was liter-bike performance in a middleweight package. The reality was something less. Still, the bike (along with its improved 650 sibling) is adored by a loyal, legion of followers all over the globe and one gets the feeling that the engineers put their hearts and souls into building this ground-breaking Turbo. Billed as Honda's "corporate statement," the CX Turbo was a complicated, sophisticated, rolling tech-lab with savage acceleration -- when on boost. Off boost it resembled an overweight normally aspirated 500cc bike. But that sudden switch from Dr. Jekyll to Mr. Hyde is the very character trait that made the CXT so thrilling to ride. Interesting note: the CX engine was designed in the '70s with the Turbo in mind all along. The one design flaw, and it's a biggie, is that the stator rides in a hot, cramped bath of engine oil smack dab in the middle of the engine. Yes, it fails regularly (15,000 to 20,000 miles) and replacement in a high-buck, time-consuming affair. Unfortunately this mutant gene was passed along to the CX650 Turbo the following year. Fit and finish is exemplary -- the best of the factory turbo bunch. Handling is good for such a top-heavy bike. Average CX Turbos run about $3,500 to $4,500. Low-mileage bikes may go up to $5,000 or more. Museum/showroom-quality examples can cost $6000.